Extreme Car Driving Simulator 2 (MOD, Unlimited Money) - An exciting racing driving simulator with realistic physics and great graphics. 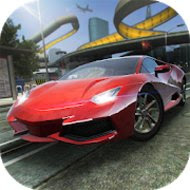 Sit down in a racing car and show all your skills of driving fast in a huge metropolis. The whole city is created for you, along the way you will not meet not one moving car towards you. Go through the tasks, drift, earn points, open new modes of transport and much more with Extreme Car 2.